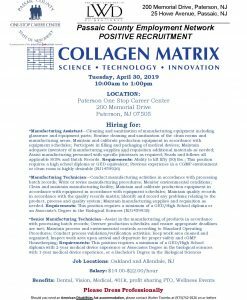 Collagen Matrix is hiring for the positions of Manufacturing Assistant, Manufacturing Technician and Senior Manufacturing Technician. Salary between $14 and $22 per hour with benefits! If you believe one of these positions is a good fit for you, come to the Passaic County One-Stop on Tuesday, April 30th between 10am and 1pm. Want to get the latest news from us?